This French language school is located on the sunny, Mediterranean-blue French Riviera unequalled for its beauty, picturesque landmarks and excitement, and where learning French becomes a wonderful and unforgettable experience.The school is housed in a luxurious Provençal villa, set on the hillside of the lovely port of Villefranche-sur-Mer, overlooking the Mediterranean’s most beautiful bay, 2 miles from Nice and only a short drive to Cannes and Monte-Carlo. 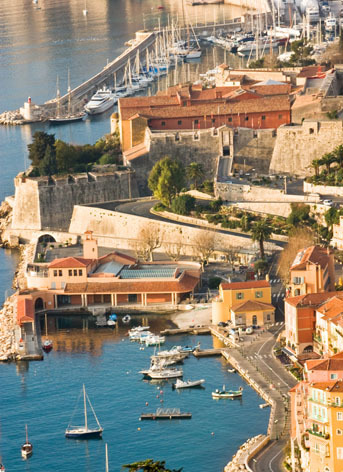 Villefranche is a picturesque port town located just outside Nice. Set in one of the most beautiful bays of the Riviera, it is popular with sailing enthusiasts, artists and tourists. Around a quaint “old quarter”, can be found a 15th century citadel, a chapel decorated by Jean Cocteau, an Oceanographic Institute, the Sailing and Motornautic Club and many delightful little restaurants. Villefranche offers vacationers beauty, charm and historical sights that make it truly one of the outstanding spots on the French Riviera. Local buses run along the coast every 15 minutes from Villefranche to Nice, Cannes and Monte-Carlo. 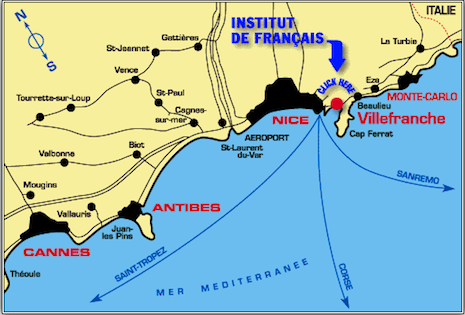 Nice has an international airport with connections to the major cities of Europe and the world (the taxi fare from Nice Airport to Villefranche should be around 80-100 Euros). A bus goes from Nice Airport to the Nice Central Bus Station where another bus can be taken to Villefranche. The stop in Villefranche is close to the Institut and is called “Place de l’Octroi”. Nice is also linked to other Riviera cities and Paris by a High-speed Train (TGV).